It begins at Notre-Dame de Paris, works its way out into the countryside south of Paris and finally down into the old city of Chartres, where it concludes with a glorious pontifical High Mass (in the old Latin Rite) inside the great gothic jewel of Christendom--the Cathedral of Notre-Dame de Chartres. The route can be muddy, rocky, and demanding, but the rewards of such penitential exercise are eternal. Hundreds of traditionalist priests accompany the 10,000-plus pilgrims, and the Traditional Latin Mass is offered each day. Each chapter is accompanied by at least one chaplain, who hears confessions and gives spiritual direction to each pilgrim who avails himself of the priest's presence. Each chapter is led by a layman and, in fact, the entire pilgrimage is organized by laymen. 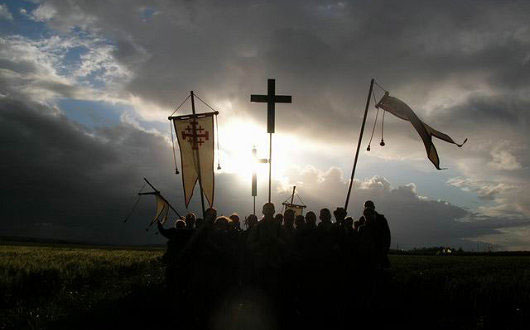 The pilgrimage originated in the 12th century, with interruptions only for the various wars in which our European brothers found themselves entangled from time to time. It was reorganized by traditional Catholics some forty-five years ago, after having died out in the post-conciliar confusion. Next year will be The Remnant Chapter of Our Lady of Guadelupe's 30th anniversary on the Notre-Dame de Chretiente Pentecost Pilgrimage from Paris to Chartres—which for me is difficult to believe. Thirty years on the Road to Chartres! Over that time, it has been my privilege not only to walk the pilgrimage every year with our French brothers, but also to do my part to help them promote this annual labor of love for the Old Mass, the Sacred Heart of Jesus and the Mother of God. Serving as U.S. Coordinator for Notre-Dame de Chretiente (NDC), I promote the Pilgrimage here in the States, help manage U.S. pilgrims and recruit new U.S. chapters. Where for many years we were the only U.S. chapter on the Chartres Pilgrimage—after having had the distinction of being the very first U.S. chapter in history—I’m happy to report that there will be four contingents from the United States this year. This is significant, especially considering that when I first heard of this pilgrimage back in 1990—after Remnant columnist Gary Potter had covered it for my father in the pages of The Remnant—I thought somebody was pulling my leg. The very idea of pilgrimage at that time—i.e., an organized, large-scale walking pilgrimage to a holy place—seemed positively medieval to us…something one read about in the pages of Chaucer, sure, but certainly nothing one could still go out and actually do. At that time, it seemed as unthinkable as signing up for a Crusade! 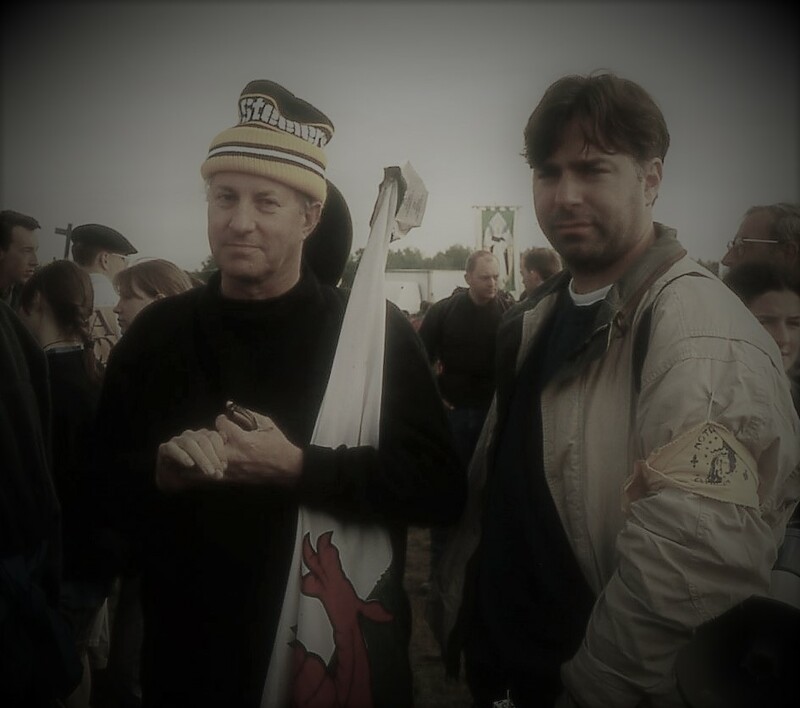 Michael Davies and Michael Matt "back then"
Today—thanks in large measure to the massive success of the Pilgrimage to Chartres—the idea of the old Catholic pilgrimage has been resurrected in dramatic and truly providential fashion. So, it seemed appropriate to finally establish the official U.S. website. The address is www.ChartresPilgrimageUSA.com and it’s a great way to introduce potential pilgrims to this Traditional Catholic 3-day, 2-night walking pilgrimage from Paris to Chartres. The new site has a nice photo gallery of pilgrimages past (which will be expanding, one year to the next), some great videos (including two produced for Remnant TV by my son, Walter Matt, one by PBS some years back, and another by my friends Joseph and Francis Check from JMJ HF Productions), how to prepare materials, on-line registration, an e-letter sign-up, and a word on the history of the pilgrimage. As I look back over nearly thirty years walking the road to Chartres, and as I consider the many important alliances forged with European (especially French) friends, as well as close friendships formed with thousands of American pilgrims—paying pilgrims as well as those sponsored by Remnant print subscribers—during this life-changing spiritual adventure, I must confess to a certain sense of nostalgia and perhaps even a bit of pride at the thought of the many good things that have happened to so many as a result of this wonderful traditional Catholic effort. Countless conversions and reversions have taken place along the road to Chartres, vocations to the priesthood have been heard, and over 30 marriages have come out of the U.S. Chapter over the past three decades. Looking back, I would say that it has been one of the great honors of my life to have worked for the greater glory of God by establishing American participation in this decidedly French (and thus decidedly beautiful) Traditional Catholic event. The Pilgrimage to Chartres is like an old and dear friend who has given so much and who has changed our lives forever. So, I’m very pleased to introduce friends of The Remnant to this new Chartres Pilgrimage website. I’m sorry to say that this year post-Chartres Remnant Tours’ pilgrimage to Vienna and Budapest sold out very early on this year, and so registration for that is now closed. But please be aware that our U.S. Chapter on the walking pilgrimage ONLY is still accepting reservations. Pilgrims can register at the new website, or they can send $75 to Remnant Tours, PO Box 1117, Forest Lake, MN 55025. This, of course, does not include airfare or hotels, but it does reserve your spot in the U.S. Chapter, provide security clearance, a French and English song/Mass booklet, food and water during the walk, etc. I do hope you enjoy our new website. If you’d share the link on social media and with friends and family, I’d be so very grateful. Also, sign up for the U.S. Chapter e-notifications for all the latest, including a heads-up when the new elements referenced above have been added to the site. Hope to see you on the Road to Chartres!